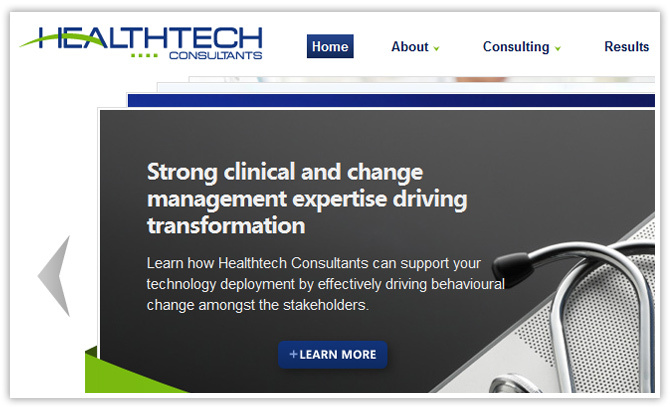 Healthtech Consultants - Portfolio | A Full Service Marketing Agency based in Toronto, Canada - Karmatize Inc.
Healthtech Consultants is Canada's leading Information Technology (IT) and Information Management (IM) consulting firm. They have been providing IT and IM consulting services to healthcare organizations for over 27 years. Healthtech is a company with a strong brand and reputation but they were trying to find a way to extend that online. They wanted an online presence that engaged their visitors and focused on conversions while at the same time highlighting their expertise and experience. Healthtech had a unique target demographic that greatly valued quality content. It comprised of governments, hospitals and professional organization that wanted access to high value information. So we started from the beginning developing a content strategy that would increase engagement and participation. We carefully indexed all of their images and text they had, while at the same time reorganizing them into sections that would make sense usability wise. Once we established a strong content strategy, we focused on establishing strong visuals and action items to highlight the information. A clear hierarchy & focal point needed to be found and we went through many design iteration with Healthtech to meet this goal.